Although the name “Quail Cove” sounds like it might either be part of an inlet or a great birding area, it is neither. Located on Virginia’s Eastern Shore between Machipongo and Nassawadox, Quail Cove is actually our treasured local “organic foods plus much, much more” store. 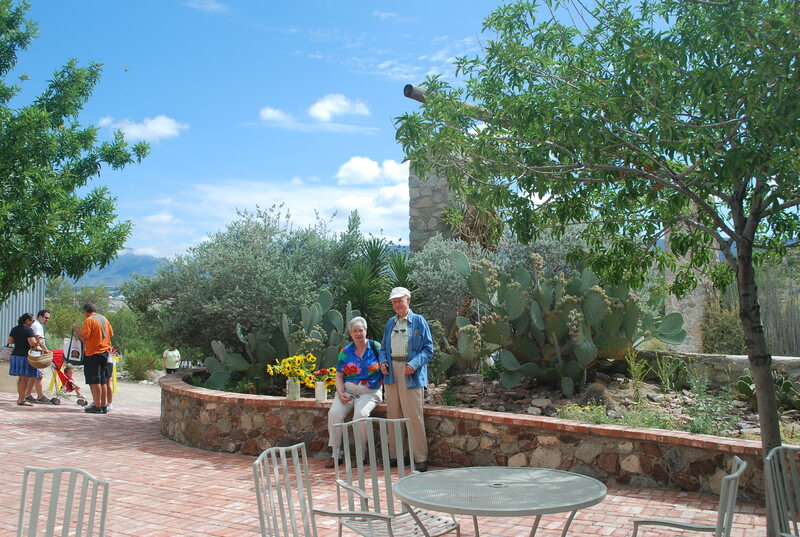 It’s formal name is Quail Cove Farm and it’s a fun place to visit. About twice a month, usually on a Saturday morning, I go and stock up on goodies and staples for the weeks ahead. 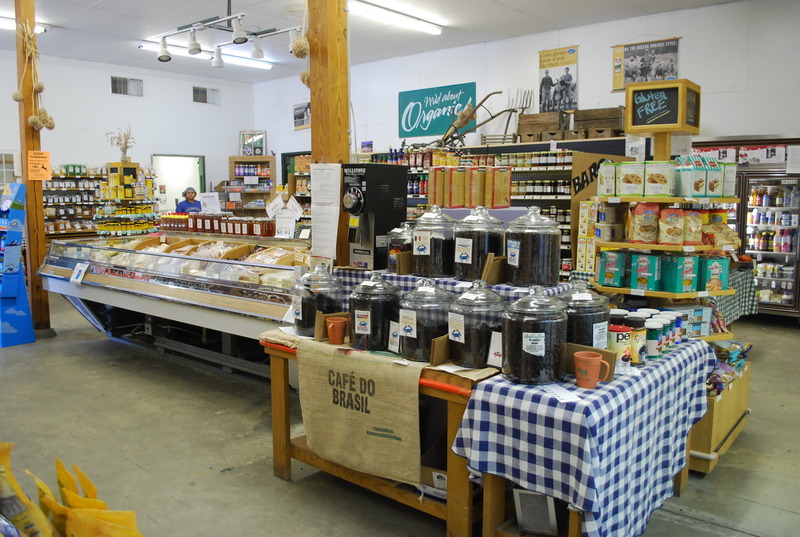 I first started shopping at Quail Cove about eight years ago when, for health reasons, my husband decided to switch from regular milk to soy milk. Now one wouldn’t think, in this era of emphasis on watching calories and sugar content, that it would be difficult to find soy milk that has no added sugar. Ha ! Just try it ! (Although I’ve heard that now the Silk brand sold in the milk section of most grocery stores has a no- sugar- added offering I’ve never found it.) Anyway, a friend mentioned that Quail Cove had recently opened and that they might carry it. To my pleasant surprise, they did and they do, in no -refrigeration- till- opened ( is that a great invention or what ! ) quart boxes which we now purchase by the case. 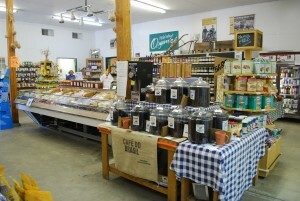 (Here’s a plug for the company who makes this great product – Westlake Organic Unsweetened Soymilk ) And that is the story of how, years ago, we got started shopping at Quail Cove ( www.quailcovefarms.com ). We’ve been going strong ever since. I wouldn’t want anyone to think that Quail Cove is just about relatively boring items like unsweetened soy milk or Muir brand canned tomatoes, so good, or a brand of yellow grits that cook up into the creamiest ever. ( I refer folks who have never eaten grits to the side-splittingly funny scene in one of my favorite comic movies, “My Cousin Vinnie”, where the main character tries grits for the very first time.) 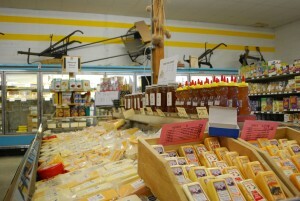 No indeed, there are lots of goodies on them thar shelves, Missy ! Like wonderful coffees blended and roasted locally by the Eastern Shore Roasting Company, Amish baby swiss and other specialty cheeses, all kinds of organically grown frozen berries, frozen whole wheat pie crusts (try finding these somewhere else), free range eggs, organically raised chickens from a Pennsylvania Mennonite farm, sweet potato chips crunchingly great with chicken salad sandwiches, lots of chocolates, my personal favorite, dried fruits and nuts in bulk, local honey, top quality vitamins and much, much more. 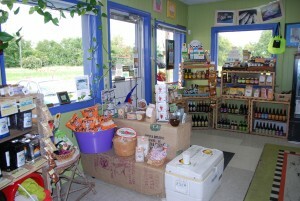 And of course, seasonal local produce and fruit, bursting with organically grown freshness. 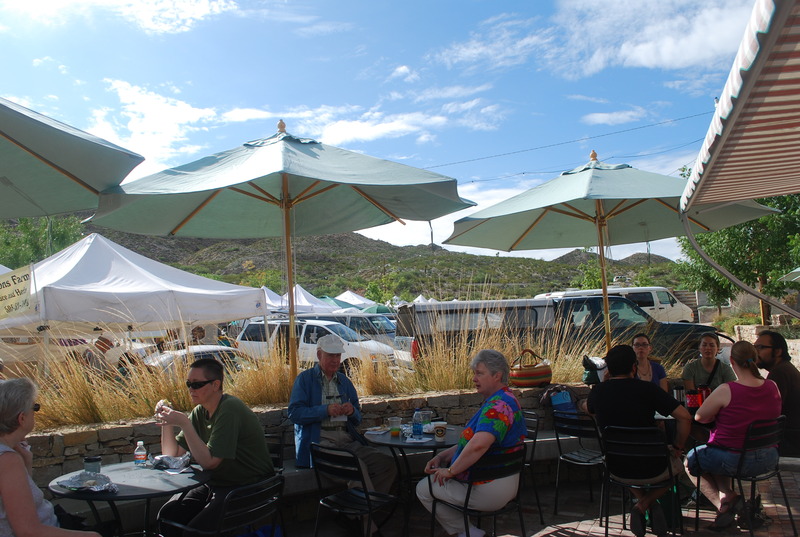 It’s easy to see why, hot or cold, rain or shine, every other Saturday morning, it’s Quail Cove time. Normally I have breakfast at home, something simple, usually cereal and fruit plus several cups of my favorite coffee, a mild hazelnut flavored brew. (Can you believe it — my husband won’t drink a flavored coffee or a mild coffee so I also brew a small pot of a dark Starbucks or some such thing for him. Ugg. ) Well yesterday I had a very early, think very, very early, meeting with a custom builder to walk a beachfront homesite with him for a client and was so rushed getting out of the house that I left my little coffee thermos sitting on the kitchen table. By the time I realized this it was too late to turn around so I had to tramp around the entire lot without my coffee, trying to be both cheerful and alert, probably failing at both. I know, poor me…..
At any rate, meeting over, I headed straight for the Machipongo Trading Company ( www.esvamtc.com) to get a fix for what ailed me. Fortunately, it is less than five minutes from our Rt. 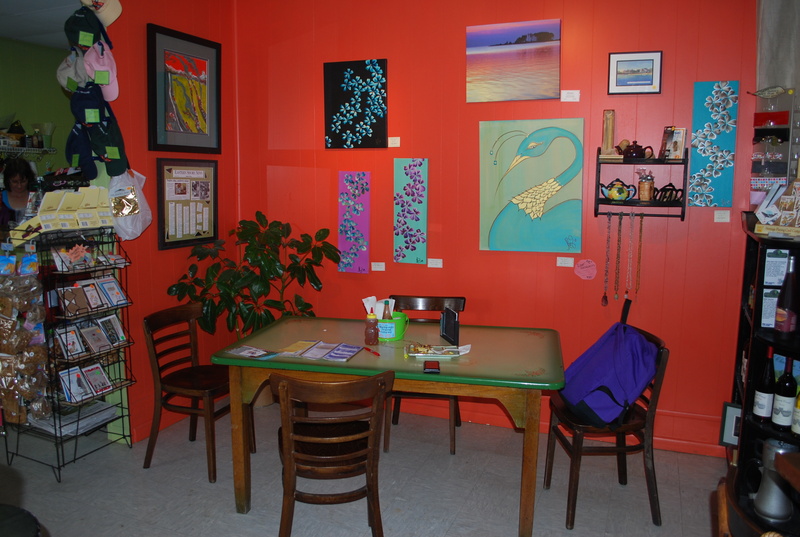 13 office and I soon found myself in this cozy, colorful little store, considering the various ways of getting some caffeine going, asap. Plenty of coffee choices to be had– cold or hot , Au Lait, Latte, Cappuccino or Espresso, iced regular or iced decaf, Frozen Espresso, High Mud Espresso and the beat goes on. But the really intriguing offering was the “Depth Charge” ! I’m guessing it is designed to wake one up clear down to the very bone marrow ! The “Red Eye Depth Charge” consists of a shot of Impact Espresso in your choice of coffee. The “Black Eye Depth Charge” is a double whammy of two shots of Impact Espresso in your choice of coffee. I contemplated both the Red Eye and the Black Eye but, in the end, I chickened out and went for the “Fog Cutter” coffee instead, it sounded like a kinder and gentler version of just what my fogged- in brain needed ! I should mention that in addition to coffee and tea, Monday through Sunday mornings, Machipongo Trading Company serves a very tasty breakfast . 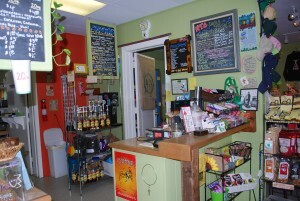 ( They also offer smoothies, luscious bakery items and an excellent lunch menu plus local art and herbal soaps but that will be for another post. ) Choose your bread, bagel or English muffin, add your choice of a good cheese and then pile on AJ’s homemade sausage, bacon, eggs, lox, etc. and you have an excellent breakfast, eat in or carry out. I especially love AJ”s sausage, made with lots of sage and other seasonings, perfect with scrambled eggs and cheddar cheese piled onto a toasted English muffin. Munch, munch, never mind the calories ! So although I opted out of being bombarded by the “Depth Charge”, nevertheless the Fog Cutter did its job, the rumbling tum was sated by an AJ sausage sandwich and life looked good once more ! Looking To Buy Boating Property In Virginia ? Then You Need A Home For Your Boat ! For many of our customers looking to buy boating real estate on Virginia’s Eastern Shore, finding a home for their boat is as important as finding a home for themselves. Well….nearly. Being a peninsula , with the Chesapeake Bay to the west and the Atlantic Ocean to the east, the Eastern Shore of Virginia features mile upon mile of saltwater coastline. It’s a boater’s dream location !! From the normally calm waters of the Chesapeake Bay to the deep swells of the Ocean, there is a type and depth of water to suit every boater’s requirements. Our customer’s watercraft range from deep keeled sailboats to kayaks and everything in between including yachts, smaller power boats, flat bottom scows, pontoon boats and canoes. And every boater wants to find a nice, comfy home for their boat. The three obvious abodes include: 1) A marina 2) Your own backyard dock or 3) On a trailer in your yard . Fortunately, the Eastern Shore is well equipped for any and all of those options. 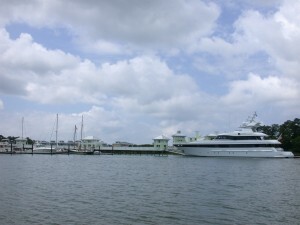 Which option one selects usually depends on boat size and your real estate budget. Marinas are an easy choice for any boat owner because they are so convenient and because they can normally accommodate any size boat. 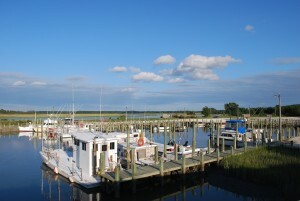 In Northampton County, two excellent Bayside marinas are located in Cape Charles and the tiny town of Willis Wharf on the Seaside features a Seaside marina. Plus an 86 slip private neighborhood Bayside marina for residents and guests only is offered in a tiny community near Cape Charles. (On the Eastern Shore of Virginia, the main north-south highway is Lankford Highway, U.S. Rt. 13. Everything on the east side of the highway is referred to as “Seaside” and everything on the west side is referred to as “Bayside”. ) 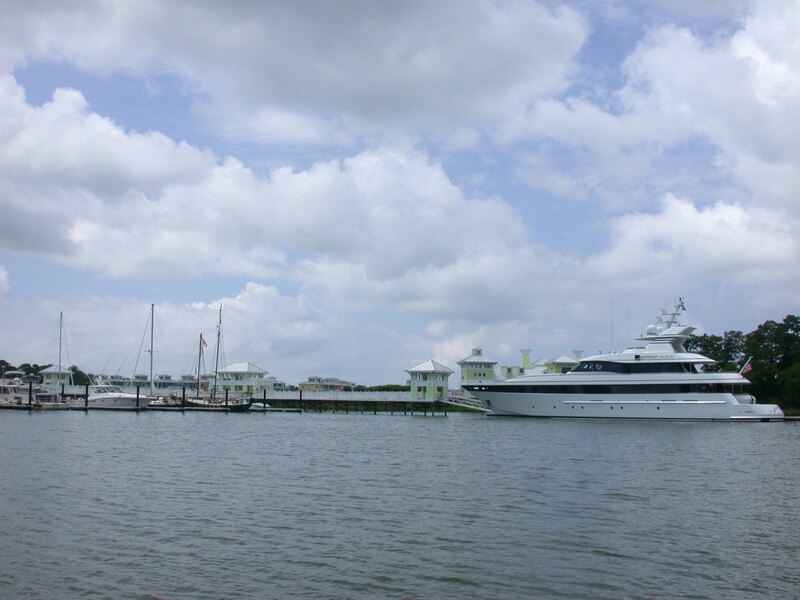 The Bay Creek marina, located at the mouth of King’s Creek as it meets the Chesapeake Bay, is a new, full-service, state of the art facility. Named by Southern Boating Magazine as one of its “Top Ten To Visit”, it features floating docks and can accommodate boats up to 150 feet, with water, electricity, fuel and the Complete Angler, a well-stocked marine store on-site. Perfect for any boat and within an easy 15-20 minute drive from almost any property in Northampton County. A great home for boats ! Next place to consider is keeping your boat at your own backyard dock. This is where the keel meets the water, so to speak, because unless your boat’s home is more important than your own home, it is critical to match your boat to your property and not vice versa. Many a customer has come down looking to buy a lot or house on the Eastern Shore of Virginia thinking they must have at least 3 feet at MLW to accommodate their current boat. But then they fell in love with a home that offered only 2 feet at MLW and was not suitable for that particular boat ! Ah, well … so my advice in these instances is that unless one is going to be on the boat more than in the house then it’s better to go the marina route or get a different boat, one better suited to the backyard home you can provide for it. Tough advice but someone has to offer it ! Another very popular option here is to house your boat on a trailer which can be kept in the yard or garage and pulled to whichever spot is hot that day. In Virginia, a boat up to 28 feet can legally be trailered on the highway and a great many very nice boats fit into that category. This option is especially popular for those ardent fishermen ( or fisherpersons) who often times want to launch on the Seaside rather than Bayside or the other way round. 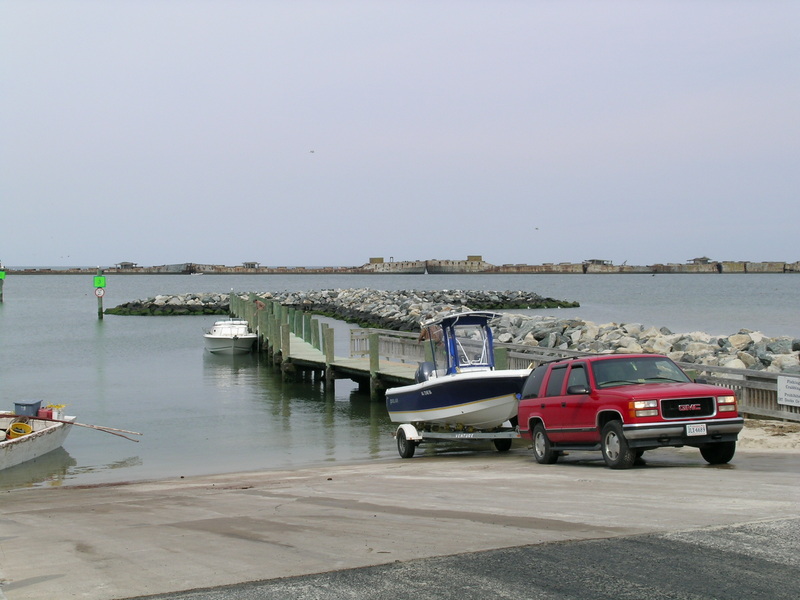 Trailering to the preferred boat ramp can save a lot of time and distance. 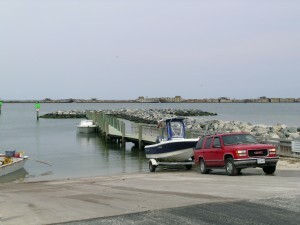 Fortunately, we have at least eight different boat launch ramps in Northampton County ranging from the excellent Bayside ramp at Kiptopeake State Park which puts you right where the Chesapeake Bay and Atlantic Ocean merge all the way up to the Seaside ramp at the Willis Wharf marina at the northern end of the county. Obviously, home, home on its trailer is often a good solution too. 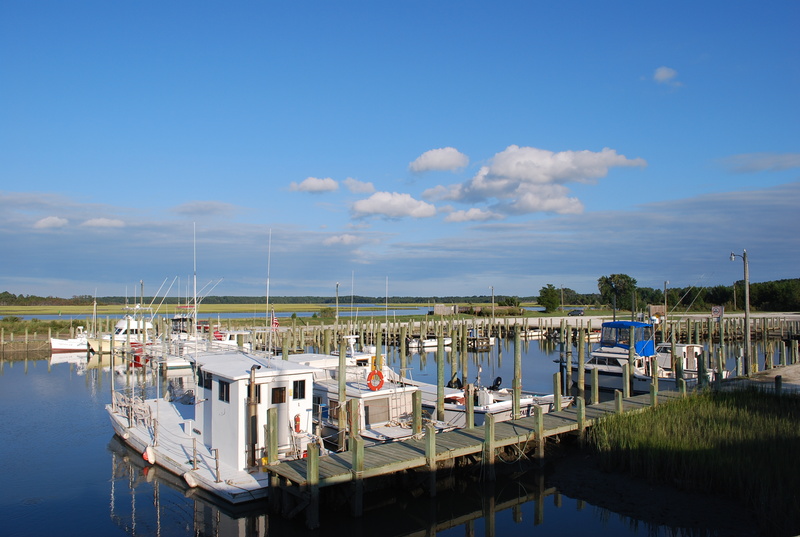 So rest assured, if you’re considering buying property on the Eastern Shore of Virginia and having it as your home port, there are a lot of good options here for berthing your boat. And with hundreds upon hundreds of miles of Chesapeake Bay, Atlantic Ocean and saltwater inlets to cruise, we are a boater’s dream come true. Come on ashore, matey, and we’ll show you some great homes for sale for both you and your boat ! The first thing to be said about Franco is that he is a Northampton County icon, an interesting, feisty, warm-hearted transplant from New York as of about 20 plus years ago. Born in Italy, he still retains a colorful Italian accent but overlaid with a strong twist of Brooklynese. Every Tuesday night you can tune into his radio show on local station WESR to hear him play some classic tunes and expound on the issues of the day. Franco is a tireless fund-raiser for community causes, an active member of the Chamber of Commerce, a Sunday afternoon fishing guru to his grand kids and he bakes a mean pizza too ! The pizza part is important because Franco and his wife Kathy are the colorful proprietors of the Little Italy restaurant in Nassawadox, Virginia, home to the best meatball subs ever. (http://littleitaly.homestead.com) When he’s not overseeing the kitchen, Franco is busy planning Little Italy’s next fun event– possibly a night with a singer of Sinatra tunes or an Elvis impersonator or the bi-monthly Texas Hold-em Poker Tournaments, with profits going to charity, this month to Habitat for Humanity and the Little League. The list of Franco’s activities and accomplishments is almost endless, including a run for the Board of Supervisors. So when my middle daughter was picking up a vegetable calzone from the restaurant the other day, Franco inquired as to whether she liked figs and if so, stop by his house and pick some, his back yard tree is loaded with an early ripening variety. Well, we all love fresh figs and our two varieties do not ripen for another couple weeks so we took advantage of his offer last Sunday. It was a beautiful breezy day, sun shining but not too hot, I was in the neighborhood to take some photos of a new waterfront lot listing and it seemed like a perfect time to round up a few figs for breakfast. Now the first thing to be said about fresh figs is this — if you’ve never had one, you’ve missed a real winner in the fruit arena ! 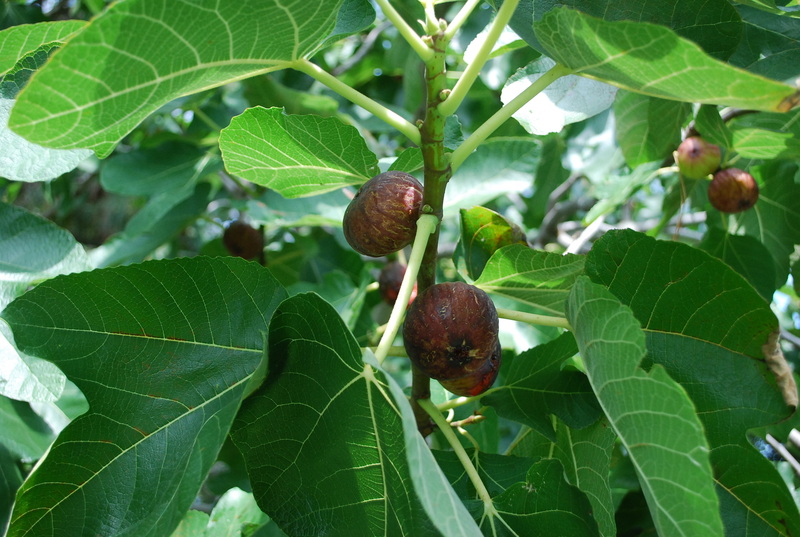 Unfortunately, they are very a delicate, soft fruit and so fresh figs are seldom found in a grocery store– you usually have to have a friend with a tree or better yet, your very own tree(s). 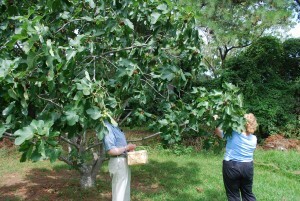 The Eastern Shore of Virginia is a great place to grow figs because we have rich soils and a mild climate ( figs don’t do well in cold climates, freezing usually kills them, so they have to be grown in pots and moved indoors in the winter). Here they are grown in the yard just like any other fruit tree and they thrive without any work. Just stick them in the ground in the late fall, forget about them and in a few years you’ll have a tree with all the figs you can eat and give away. There are at least a dozen varieties here which with I’m familiar, with different sizes and ripening times, but the most commonly grown figs on the Eastern Shore are the Brown Turkey, small, only about an inch long, the Black Mission fig, very large, almost the size of a small apple and the Celeste, a lovely pale green variety. We have a huge Black Mission tree and a smallish Brown Turkey tree in our little home orchard and they keep us well supplied with mid to late season figs. But Franco’s early ripening figs are a different variety, not sure what– they remind me of those candies with a liquid center because when I bite into one of his figs they squirt juice from what seems to be a hollow, juice filled center. Absolutely wonderful , sweet and acid at the same time, sort of like fresh pineapple in that respect, after a while your tongue starts to tingle. While my husband likes fig preserves and dried figs as well, I only like them fresh, preferably well chilled, usually for breakfast or for dessert. However, served with a thin slice of salty Virginia ham (http://smithfieldhams.com ) , they make a tasty lunch or appetizer, which is what I think I’ll do with the rest of the figs we picked from Franco’s backyard tree. Yum, yum ! You probably have never thought about having a few chickens but if you have thought about it you have probably wondered … how does one get chickens, and more importantly, what kind of chickens should one get ? Are they all the same ? Do you need a rooster if you just want eggs ? You will have so many questions once you decide to get started. I can share my limited knowledge and perspective on the topic but I am by no means a chicken expert. (As a long time subscriber to that amazing magazine, Mother Earth News, (www.motherearthnews.com ) we have put into practice many of their tips on sustainable living and going green. 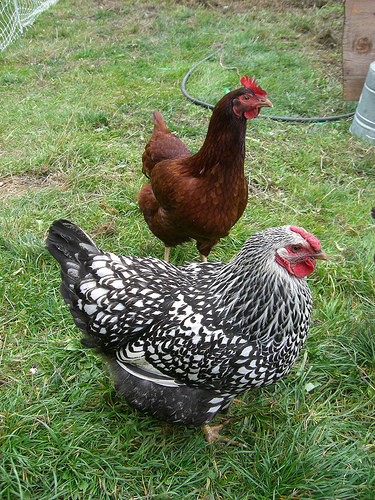 (I’ve been reading some of their suggestions on raising chickens at home for years.) At any rate, we now have a few chickens and we enjoy having chickens, that’s the long and the short of it. For us, everything “chicken” started with some friends giving me a dozen eggs from their little farm, “Shoestring Farm”, located on Church Neck. (On Virginia’s Eastern Shore, a “Neck” is a protrusion of land surrounded on two sides by broad saltwater inlets from the Chesapeake Bay or Atlantic Ocean. 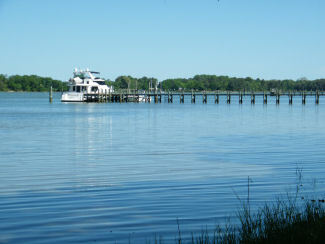 A “Neck” is named for one of its bordering inlets, in this case for the Church Creek inlet from the Chesapeake Bay.) My husband cooked these colorful brown eggs the next morning for Sunday breakfast. WOW, I remember thinking, I didn’t know that eggs had actual FLAVOR. That was it for me, I was sold on having fresh, flavorful eggs which did necessitate getting some chickens to lay them ! My husband , who also reads Mother Earth News , had wanted to get some chickens for years and I had always said NO. I’m a light sleeper and the thought of a chicken waking me up at 4:45 am was not in my plan. (My mother had chickens and her rooster would crow at the full moon, at the rising sun, at just about everything and anything. Ummm, NO THANK YOU, not for me.) Also, I didn’t think noisy chickens would help us stay in the good graces of our neighbors either. We live in a lovely home, with a huge back yard situated on nearly two acres, in beautiful waterfront neighborhood. Absolutely none of our neighbors have chickens, maybe never saw a live chicken either ! However, research revealed that if I wanted laying hens that I didn’t need to have to a crowing rooster, which solved the “waking me at dawn” and the “annoying our neighbors” problems. I figured if I addressed it with enough finesse, my husband would give up the rooster idea and settle on a compromise acceptable to me (and the neighbors) — laying hens or nothing, so…. laying hens it is. With my compromise agreed to, we were ready to select our chickens. That was the next big question. What chickens do I get and where on earth does one get chickens ? Surprisingly, it turns out that there are literally hundreds of chicken breeds for a home chicken enthusiast to choose from, different breeds for different purposes. My interest was in eggs so I wanted Pullets (all female chickens) and they need to be sexed. Yes, that is an actual occupation. Someone looks at the little parts and says boy or girl, unfortunately, not always with 100% accuracy. 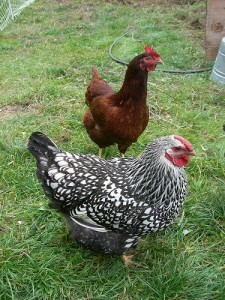 (Most large online hatcheries have a full time “sexer” and I ordered my pullets online http://www.hoffmanhatchery.com/). And how do they arrive ? Believe it or not, through the US Postal Service…yep, they call you and say “your chicks are here, PLEASE COME GET THEM ! ” And so we picked up our fluffy little baby chicks who cheep- cheep-cheeped so cutely all the way home. The next step in your egg husbandry adventure is what to do once you actually get these cute, fluffy little baby chicks home … but that’s next for the next post, so bye for now. Wouldn’t you know it, the day after I left for a family celebration in El Paso, Texas was the day of the second scheduled meeting of the Eastern Shore Beekeepers Guild. Per some previous posts in “Odds and Ends”, I had definitely been looking forward to going to that meeting but the occasion of my mother’s 90th birthday was not to be missed and so off to Texas we went, bee guild or no bee guild. Before trekking around we decided to have breakfast– an egg and Applewood bacon burrito topped with spicy homemade salsa and a zucchini-carrot muffin, both delicious offerings from the Coffee Stream trailer, eaten under a large umbrella on their patio which overlooks the market tents and wagons. 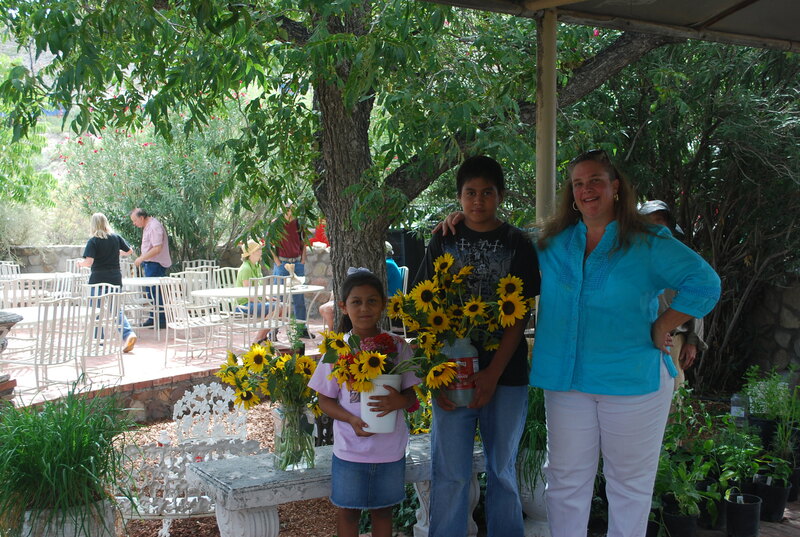 From there it was off to the produce tents where gorgeous baskets of local jalapenos, green chilies, wreaths of dried red chilies, cactus “apples”, avacados and bunches of sunflowers were interspersed with the more traditional cantaloupes, corn, squash and peaches. Local artisans offered breads, lovely soaps, herbs, shirts made from smooth local cotton, handmade baskets, paintings , etc. I love Farmer’s Markets and it’s always fun to go to them in different parts of the country to see the local specialties being offered. This one was no exception. I would say that the long and short of bee-ing near the desert is that the bees on the Texas-New Mexico border definitely have darn good eyes and are out there navigating around, recognizing flowers and making some top grade honey !! 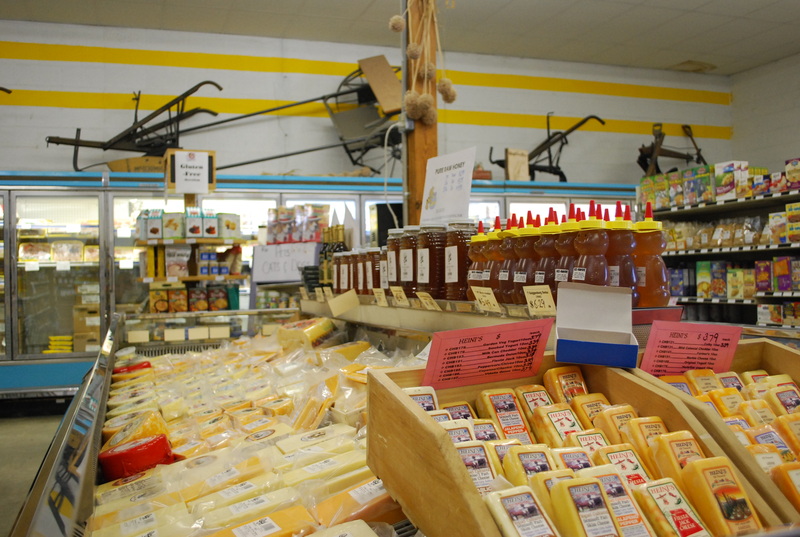 The Eastern Shore, especially Northampton County, is the prime agricultural spot in the entire state of Virginia. This has been the case since the early 1600’s when the county was first settled by the Virginia Company of London, (remember Sir Walter Raleigh ?). Our level, rock- free lands, sandy, loamy soils and good rainfalls have made farming a profitable enterprise here. 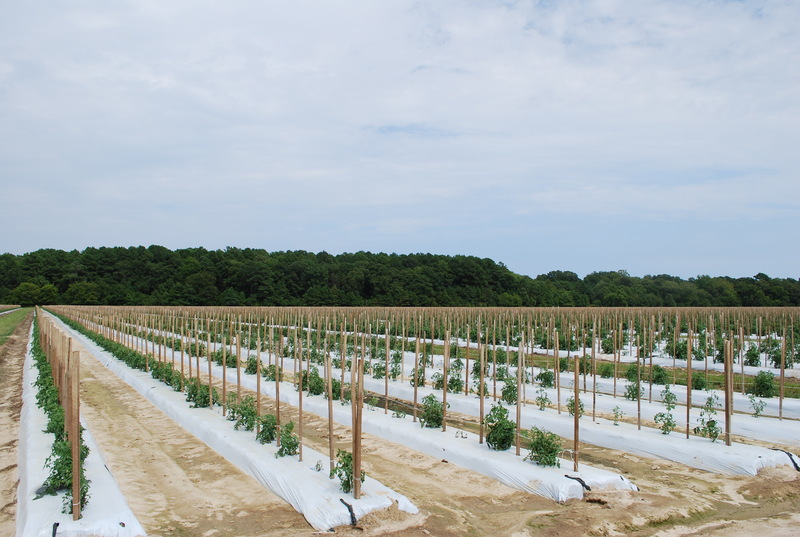 Additionally, our mild climate, moderated by the waters of the Chesapeake Bay and Atlantic Ocean which surround this slender peninsula on 3 sides, offers farmers the option of being able to harvest at least two crops each year. 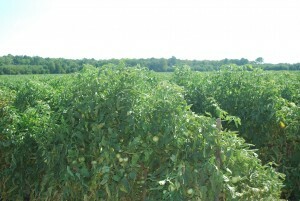 Often an early crop of potatoes, for example, is followed by late soybeans and later still by a cover crop of winter rye. Obviously this is more profitable than the one crop to which many farmers in other area are limited. Maintaining the rural feel of the Eastern Shore and maintaining agriculture and aquaculture as two of our prime economic engines is an important goal as set forth in the Northampton County Comprehensive Plan, a public-input document which provides guidance to the Board of Supervisors and Planning Commission as they make various land use and other decisions. (www.co.northampton.va.us/index.html ) We have a lot of open space and our little waterfront/water access neighborhoods are nestled in between family farms. Unlike the large farming operations out West where individual farms may often be several thousand acres in size, most family farms here are 200-400 acres and have been passed down through the generations. Land preservation trusts are becoming quite popular here in an effort to help maintain farm land yet still offer current owners some financial benefits. 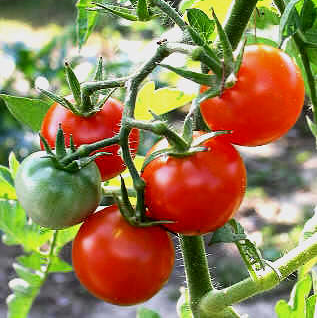 Of the large commercial crops grown here , the most colorful are the tomatoes. 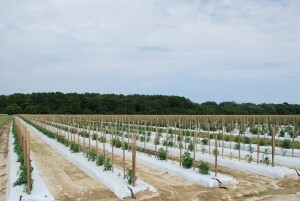 Most tomatoes are picked while still green so that they can be boxed and shipped without bruising to grocery stores throughout the Eastern Seaboard. Driving past hundreds of acres of pale green tomatoes gleaming in the sun is a pretty impressive sight. But after the second or third picking , when the very best have been harvested for slicing tomatoes, the rest of the crop is left to ripen on the vine to send to the canneries for catsup, stewed tomatoes. V-8, tomato paste, etc. You name it, if it’s tomato and processed on the East Coast, then it’s likely our Eastern Shore tomatoes are adding to the flavors. Which is why, when I am driving along the back roads this time of year and seeing large baskets full of the pale green globes being picked from the fields, I know that deep red marinara sauce on the vine will shortly follow, the essential ingredient in the delicious Chicken Cacciatore or Eggplant Parmesan which I look forward to fixing when the cool autumn weather arrives. When I think back on my real estate career, I cannot remember a time when the stars were so favorably aligned for getting both a fabulous deal AND an amazingly low mortgage rate. (Remembering back to my salad years of the mid- 1970’s, when prices took a drop then, mortgage rates were about 12-14%. The price drops of the early 1990’s saw mortgage rates of 8-10%. ) One of the advantages of being “older and wiser” is that I believe can recognize a great time to buy when I see one. And I’m seeing one now ! Like most other areas, the Eastern Shore of Virginia has been effected by the real estate downturn. We have had very few waterfront home foreclosures — attractive short sale opportunities have been more likely. Since a number of the folks who are purchasing waterfront and water access properties here are doing so for retirement purposes, a purchase here often necessitates a sale of their primary residence in another state. And as Sherlock Holmes would say, my dear Watson, it is elementary that therein problems may arise. Because, of course, many other areas have been quite hard hit and so selling a home elsewhere may take a while. The ” I need to sell my home first” phenomena has created a current situation where sellers who are motivated may accept offers which are very attractive from buyers who are ready and able to purchase without having to first sell a property elsewhere. Combine a motivated seller with a ready and able buyer and voila ! a prescription exists for getting a great deal on purchasing a property here. Which, of course, explains why buyers who have already sold their home, or who are purchasing for leisure home use and therefore don’t have to sell something elsewhere, are finding some really, really attractive purchase opportunities ! Combine these great purchase prices with the amazingly low mortgage rates ( in the 5% range or even somewhat less) and you can clearly see why buyers are getting the deals of a lifetime, right here and right now !!! So whether you’re looking for a beach house, a boating property, a historic home, a water access home or a condo give us a call at (757-678-5200) for information about some of our latest and greatest deals on single family homes, condos or land parcels — it really is time to take advantage of the Eastern Shore of Virginia’s great real estate deals at today’s amazingly low mortgage rates ! You are currently browsing the Life and Real Estate on the Eastern Shore of Virginia blog archives for August, 2010.